Despite its prowess in RS, RSR, GT2 and GT1 form (winning at Le Mans, Daytona and Sebring), the Porsche 911’s competition roots actually began on the international rallying stage. Entered by the factory, Herbert Linge and Peter Falk guided their 911 to fifth in the 1965 Monte Carlo Rally, just a year after the flat six sports car was released to the public after it’s 1963 unveiling in Frankfurt. For the 1967, factory 911s were back on the world’s stages as mercurial talent, Vic Elford secured that year’s European Rally Championship, a feat repeated by Pauli Toivonen the following year. The beginning of something special. Herbert Linge and Peter Falk’s 911 is readied for the 1965 Monte Carlo Rally. 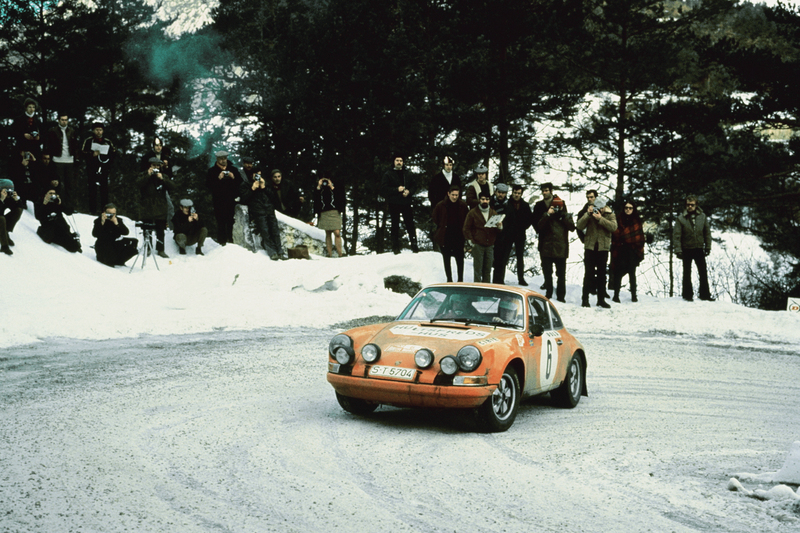 1968 also saw Porsche’s first success at the Monte Carlo Rally as Elford triumphed in a 2.0-litre 911T, followed by Toivonen in a 911S. 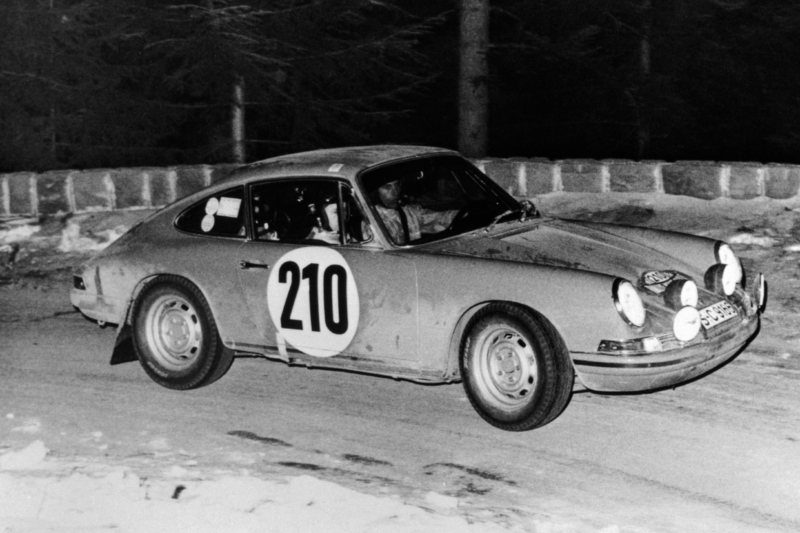 Thawing ice had helped Zuffenhausen’s charge but, the following year, Porsche proved it was no fluke. Swedish superstar, Björn Waldegård triumphed in a Scania Varbis-run 911S in the 1969 ‘Monte’, doubling up in 1970 (top image) at the wheel of the new 2.3-litre Porsche 911 S/T. In both years, Gérard Larrousse would finish second in another 911 S/T. After a less successful 1971, works Porsche rally efforts took a back seat as the Le Mans prototypes again took priority at Weissach. The 911’s stage outings were now in the hands of privateers and none were more famous than the Alméras brothers. Vic Elford gave the 911 its first big international rally victory in the 1968 Monte Carlo Rally. In 1978, the Frenchmen ran Jean-Pierre Nicolas and Vincent Laverne to Monte Carlo victory in a 3.0-litre Porsche 911 Carrera. Not to be outdone that year, the factory entered a Martini-liveried 911 SC in the gruelling Safari Rally, finishing an admirable second. Alméras Porsche also secured victory in the 1980 Tour de Corsica before nearly snatching a famous win at the 1981 San Remo Rally with Walter Röhrl in a works-registered 911 SC. By 1984, Porsche were dipping their toes back in the rally water, setting up the Rothmans Porsche Rally Team with the fledgling Prodrive outfit. With Henri Toivonen (son of Pauli) at the wheel of their 911 SC RS, Porsche finished second in that year’s European Rally Championship. Factory Porsche 911s made sporadic rally appearances during the late Seventies, including a 2nd-place finish at the 1978 Safari Rally. The project was meant to be a stopgap until the Porsche 959 was ready for Group B competition however, delays and the FIA’s cancellation of Group B in 1986 put paid to those plans. That didn’t stop the 959 from triumphing at the Paris-Dakar Rally in 1986 with René Metge and Dominique Lemoyne, two years after the duo had scored their first Dakar win in the four-wheel drive Porsche 953 (a rally raid-specification 911). With the culmination of the Rothmans Porsche Rally Team at the end of 1986, Porsche 911s were rarely seen on the international rally scene through the Nineties (although the 964 Carrera 4 Lightweight was intended for customer special stage competition). 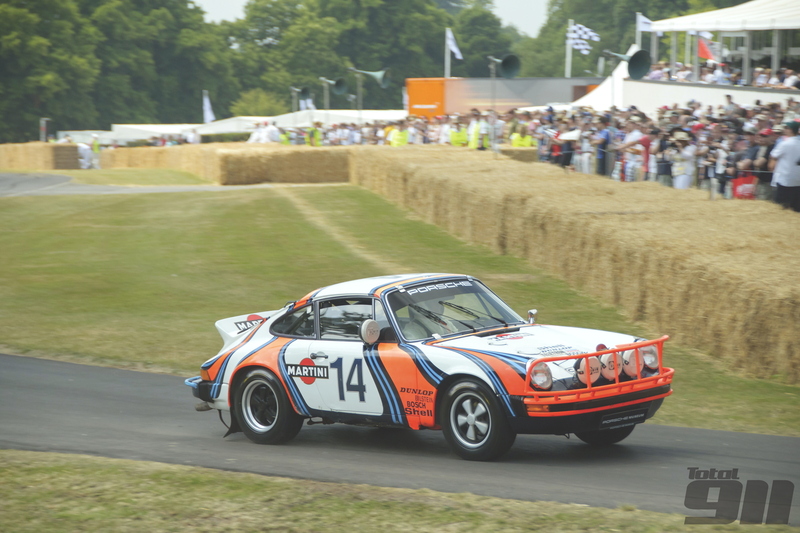 The last works rally outing came during Porsche and Prodrive’s combined Rothmans Rally Team. Belgian tarmac specialists such as Marc Duez sporadically campaigned Porsche 911 GT3s on events such as the Monte Carlo Rally during the late Nineties and early 2000s but it has taken the FIA’s R-GT plans to see a true revival in the 911’s status on international rally stage. 2014 saw Richard Tuthill give Porsche its first WRC finish since 1984 on Rallye Deutschland before WRC legend, François Delecour (in Tuthill’s 997 GT3 RS-based car) took on factory Porsche LMP1 driver, Romain Dumas’ GT3 RS 4.0 on Rallye de France. After proving hugely popular with rally fans, the FIA created the new-for-2015 FIA R-GT Cup. Getting underway this Thursday with the Monte Carlo Rally, Delecour and Dumas will be joined by Duez as a trio of Porsche 911 GT3 RSs take to the international stage, starting a new chapter in the 911’s rally history. Make sure you watch François Delecour get the Tuthill 997 R-GT beautifully sideways in this icy Monte Carlo shakedown. Tuthill’s 997 GT3 and the FIA’s R-GT concept looks set to breath new life into the Porsche 911’s stage career.